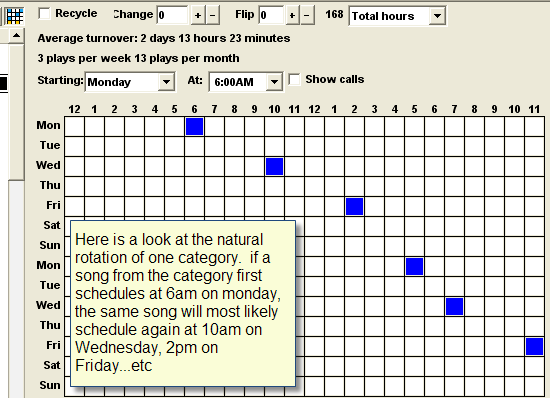 For readers who may now know, the Rotation Prediction grid shows what will happen to any one song within a category over a two-week period of time. All the squares show what will happen if the song happens to first be schedule "here" (you can select the start-hour). That same song will most likely be repeat-scheduled very near the hours where all the blue squares appear on the chart. 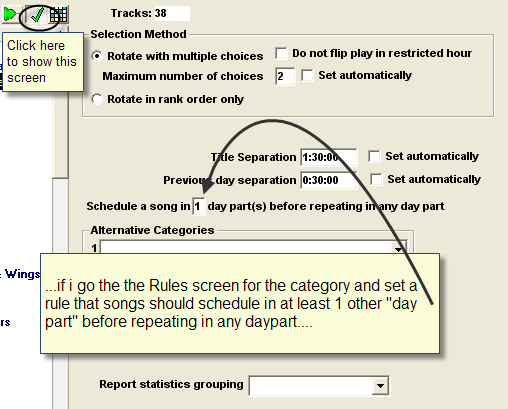 The pattern you see for one song will be the rotation pattern for any and all songs in that category. Now, on to the question: .......Orange Squares mean: Problem > Rules Conflict. Now what will happen is: the song comes up in rotation on Wednesday in the Mid-Day daypart. So, Music 1 will not schedule it there. I will 'hold' the song until the Afternoon daypart and schedule it there. 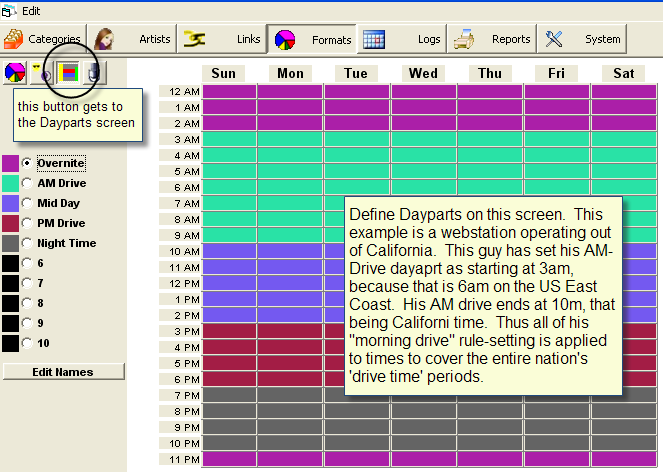 But, after that the same song will often come up for scheduling the next time in the Afternoon daypart. So Music 1 will then hold and schedule it in the Evening daypart. But then, the next time the song comes up will also be the Evening daypart. At that time, Music 1 has no place to put it. It will 'hold' the song, for scheduling the next day on the overnight show. The problem comes when you eventually get a lot of songs backed-up with the same rule and you are in the evening daypart. And Music 1 has too many of these violations and not enough open slots in the evening hours to place them. Music 1 can't jump ahead to the overnight shift because that is the next log and it does just one day at a time. Now, if you have only a few orange boxes on the rotation prediction grid, it may not be much of a problem. You'll encounter a few more rule-stops during scheduling and you'll make needed adjustments for them. But if you have a lot of orange, it is surely going to give you problems. You're going to be required to do more manual editing and choosing about what to place and where to place the songs. It can begin to take a lot of editing time. It is best to set your rotations so there is no orange on the rotation screen. For your Hot rotation, I expect you are normally wanting to have songs schedule in the same daypart two times in a row. Like, maybe 6am and again in the 9am hour. Or 10am and again in the 1 or 2pm hour. The Dayparts, of course, are user-defined. Here in the states, we normally have 5 dayparts. Morning drive-time (6am to 10a), MidDay (10 to 3p), Afternoon drive-time (3p to 7p), Evenings (7 to midnight), and Overnights (midnight to 6am). Some people define their days differently, maybe having only four, Mornings, Afternoons, Evenings and Overnight. On Music 1 user in Cyprus has defined eight dayparts for their specific needs. Look at the Rotation Prediction grids on each of your categories. If you see Orange, it is best to make some category-content changes to fix it more to your liking instead of trying to set rules that will conflict with the normal rotation patterns of the categories.